The ghost of Joan Goetz has been hanging over my shoulder for the last several weeks. 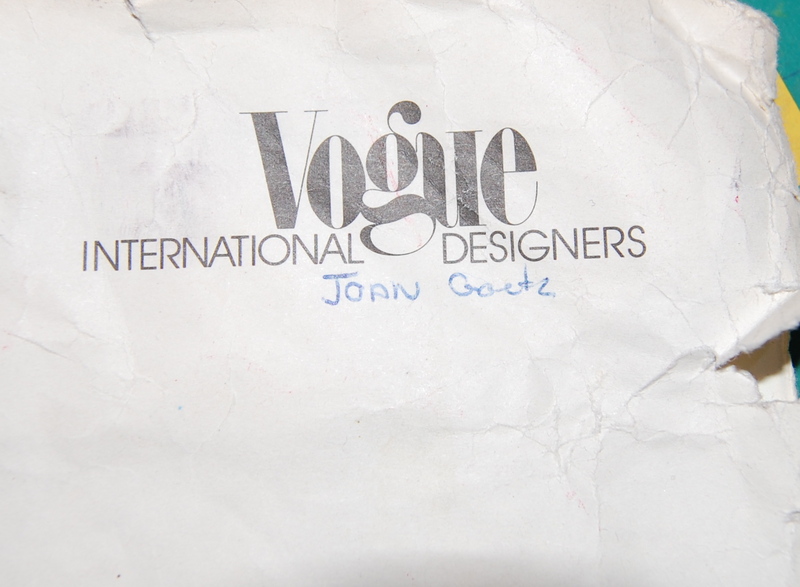 She wrote her name on the envelope of vintage Vogue pattern #2718 which has caused me so angst. I can’t help but wonder who this woman was! Goetz sounds awfully like Ghost, don’t you think? 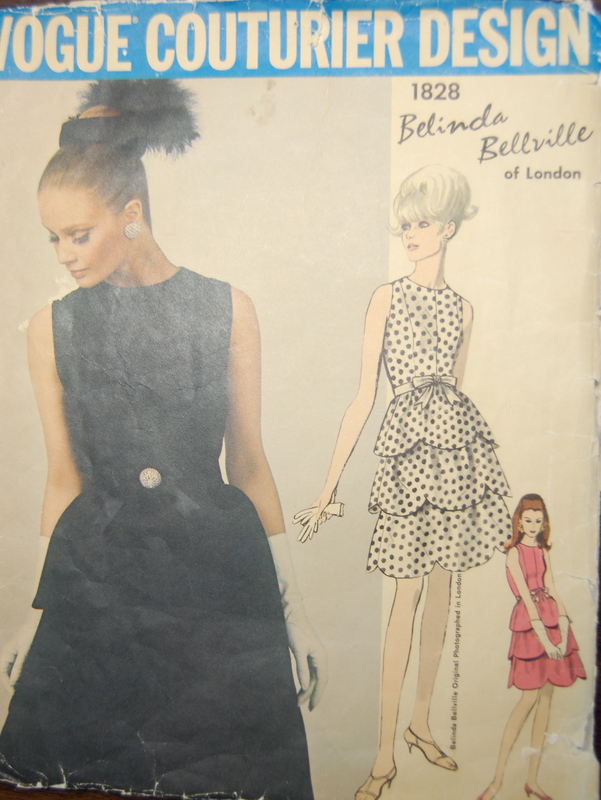 I can tell from the changes she made to the pattern that she was much taller than I, with much longer arms! She added 1” to the arm length, while I subtracted 1½”. 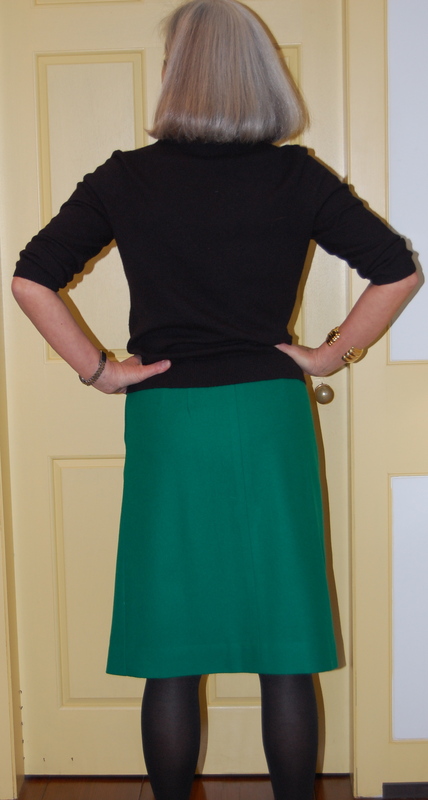 She also added three inches to the hem length, and I ended up cutting off 3” from the length. However, nowhere on the pattern does she indicate any problems with construction. 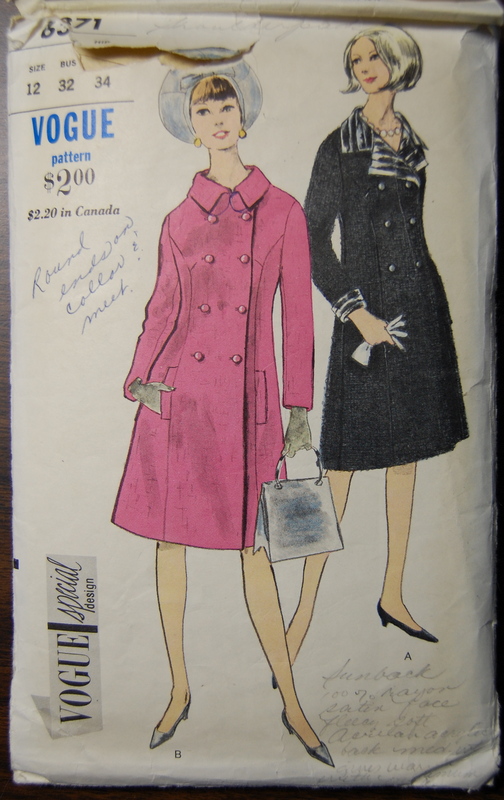 I, myself, refrained from scribbling “ARG-G-G-H“ on the pattern, although I was certainly thinking it. When last I wrote about this doomed project, I wasn’t sure if I could save it. Thanks to many good suggestions and words of encouragement from my readers, the future for this dress is looking less ghostly and ghastly. Some of you suggested a break from it, working perfectly into my schedule, which included another trip out of state. 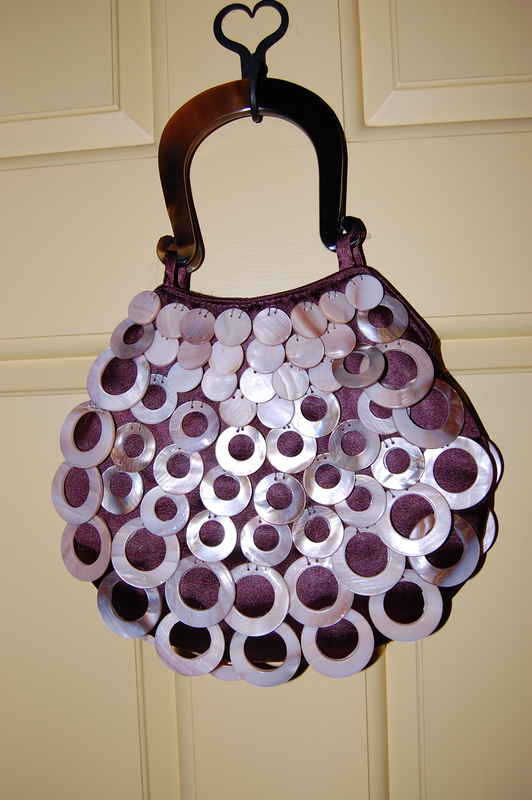 Others suggested I sew on something else for a while, which I did and will write about soon. The one thing I did not do was set it aside completely. I was afraid if I left it to finish (if even possible) another time, I never would get back to it. 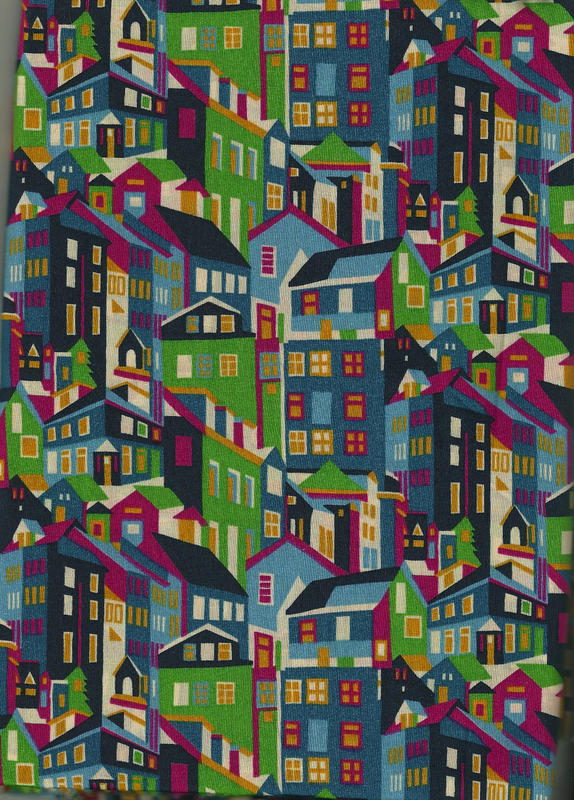 Actually, I have to admit, that the problems I encountered with this pattern were really not the fault of the pattern. It was entirely of my own making. 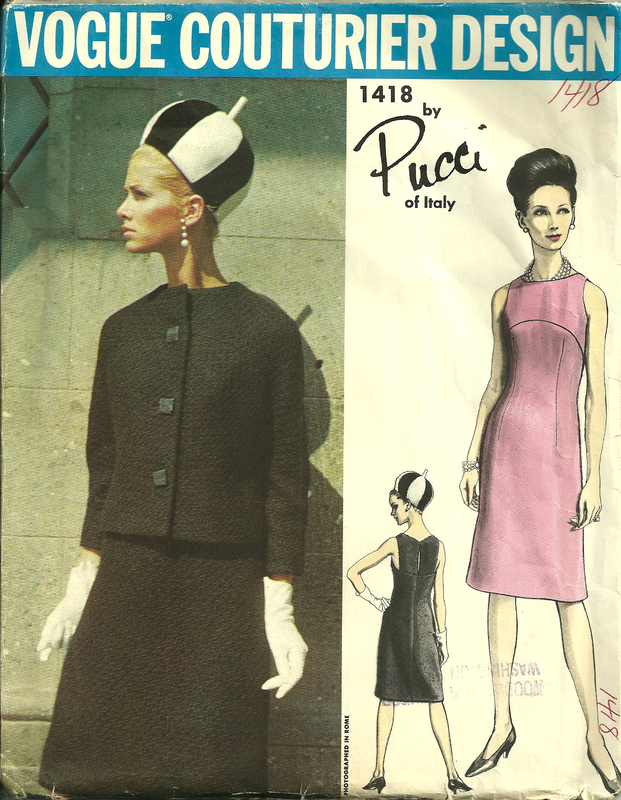 The pattern required a stretch knit fabric. 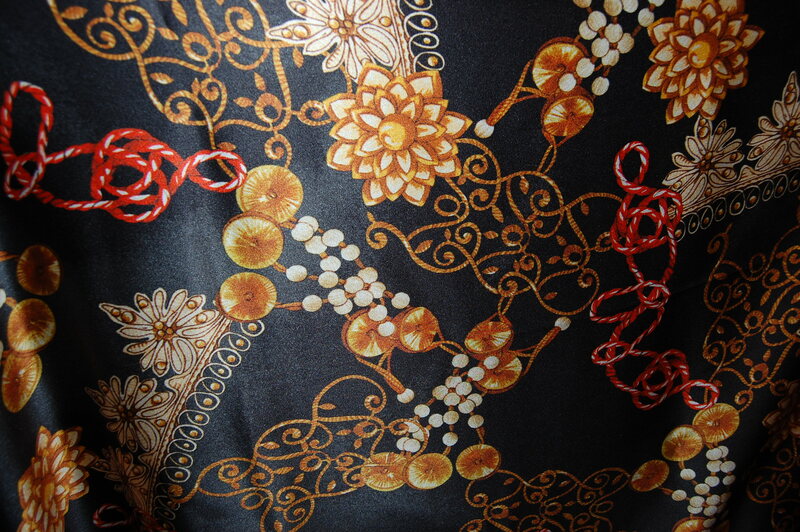 I used a stretch silk woven charmeuse. That would have been fine, except I insisted on underlining it. I cut the underlining on the bias, which I thought would work, but it was a disaster. 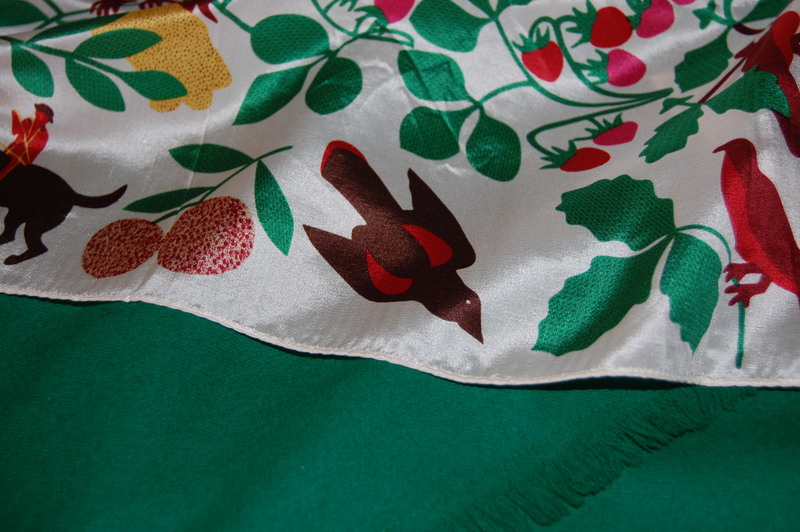 It caused the bodice to bind crosswise, pull up lengthwise, and it restricted the stretch of the silk, which was necessary for this particular pattern. 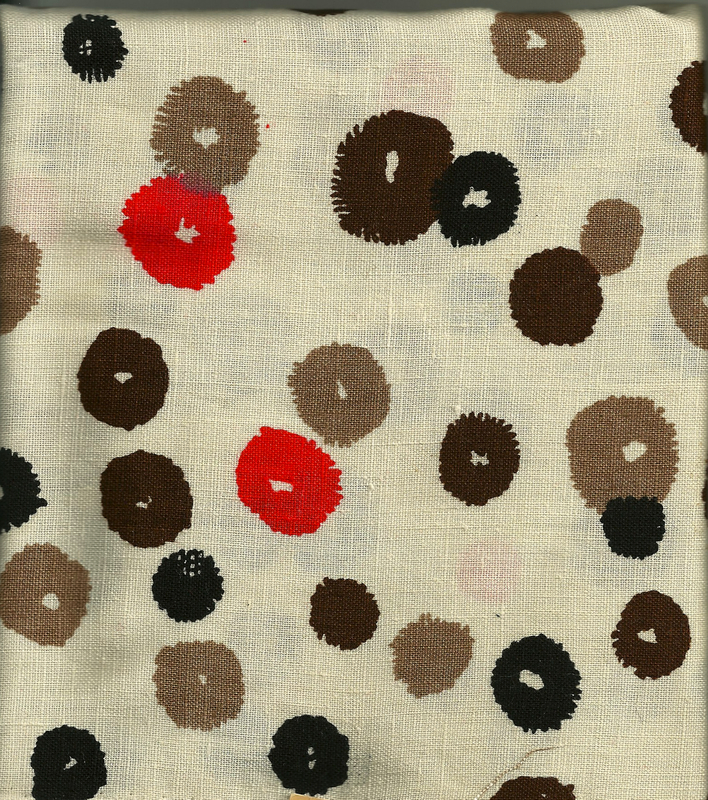 This fabric from Mendel Goldberg Fabrics in NYC is a stretch silk charmeuse, with a wonderful drape to it. With nothing to lose, I started to remove, meticulously, the silk gauze underlining from all the bodice pieces, starting with the back. I was encouraged enough at the improvement that task made, to continue to do the same with front. Then I tackled the sleeves. What a difference it made! The bodice actually started to fit, although it was still tight across the bust. 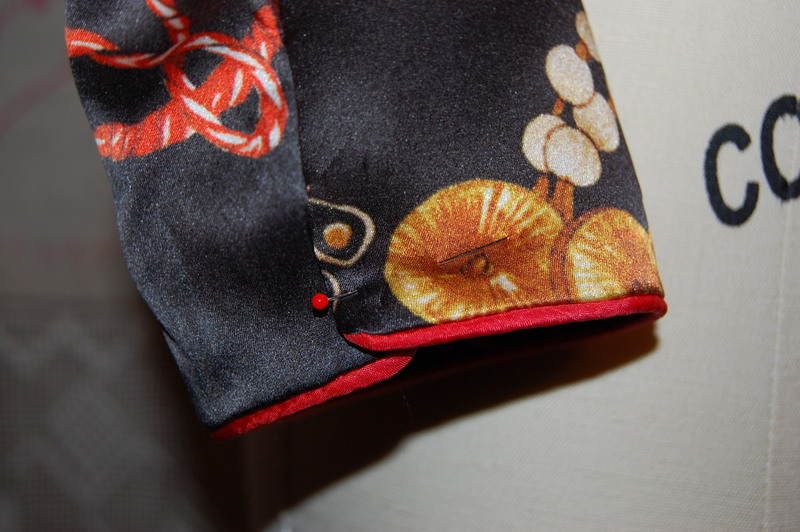 I then reset the sleeves, releasing about 1/4 “ in the front seam on each side. 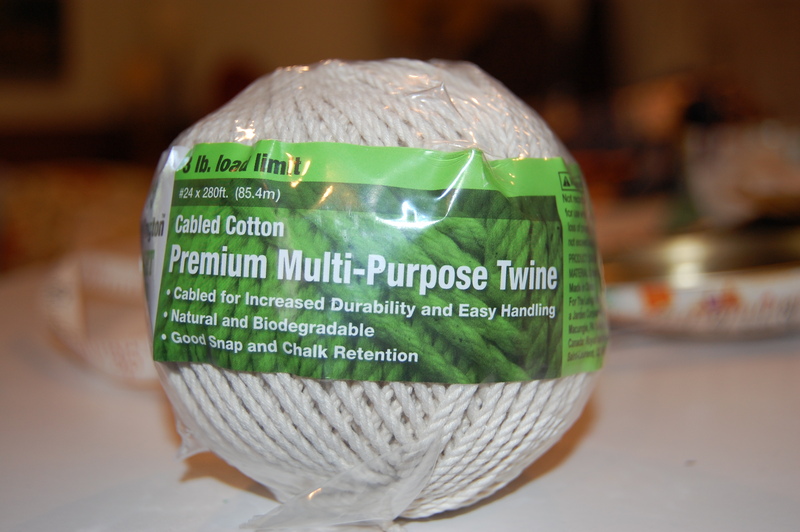 That was all I could steal from my already-trimmed seam allowances. 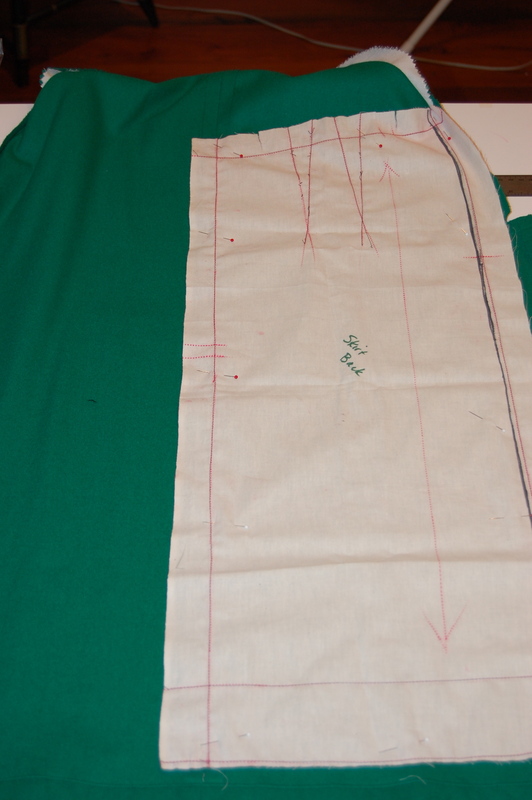 The reset sleeves and the finished neckline, cut a little wider than the pattern. 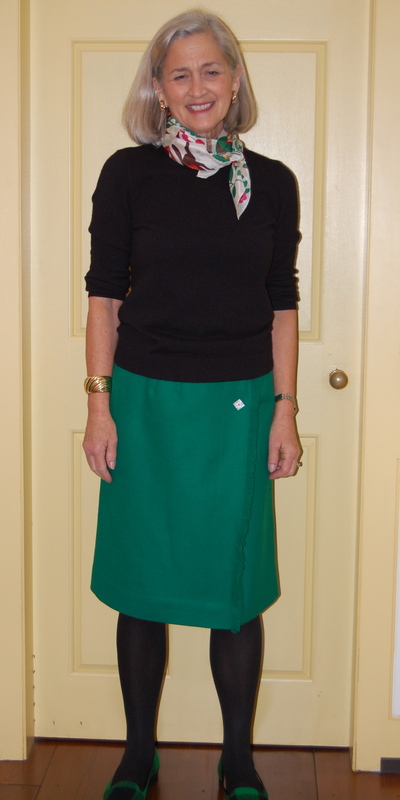 I sewed the skirt yoke without underlining, but I did use an underlining, cut on the straight of grain, for the gathered skirt. 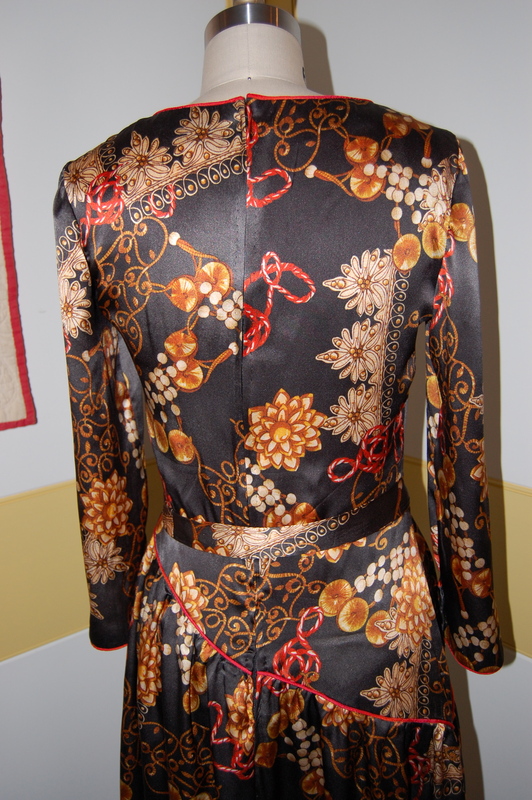 Once all assembled, I basted in the zipper to check the fit. Still a little tight over the bust, but otherwise, not bad!! 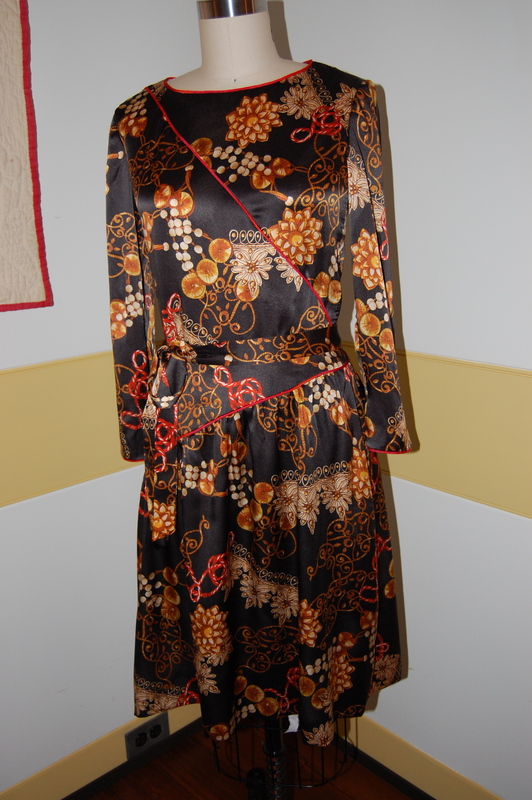 Both views of the pattern show the dress with a purchased belt. I tried three different black belts, of varying widths, and did not like the effect of any of them. All made the dress look like it was cut in half. I took a few scraps of my fabric and tied them around the waist on my dress form. 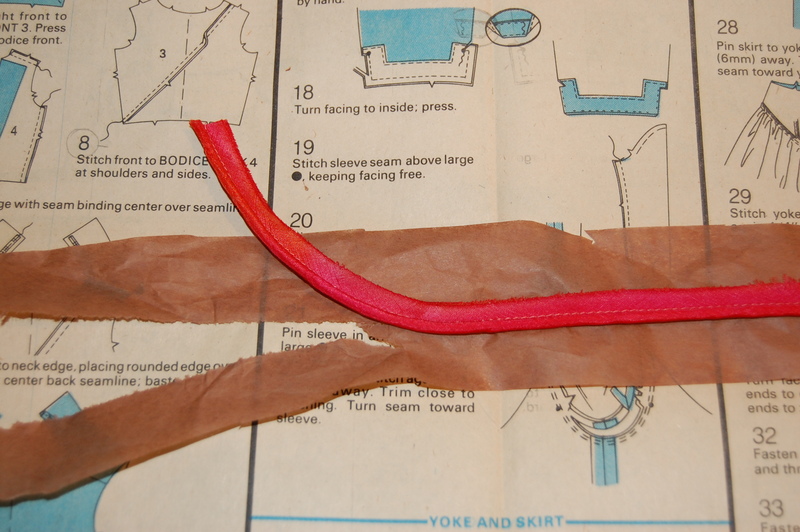 From this I could tell a self-belt would look so much better, but all I had left were scraps. Hopefully no one will notice that this sash is pieced together in four places! 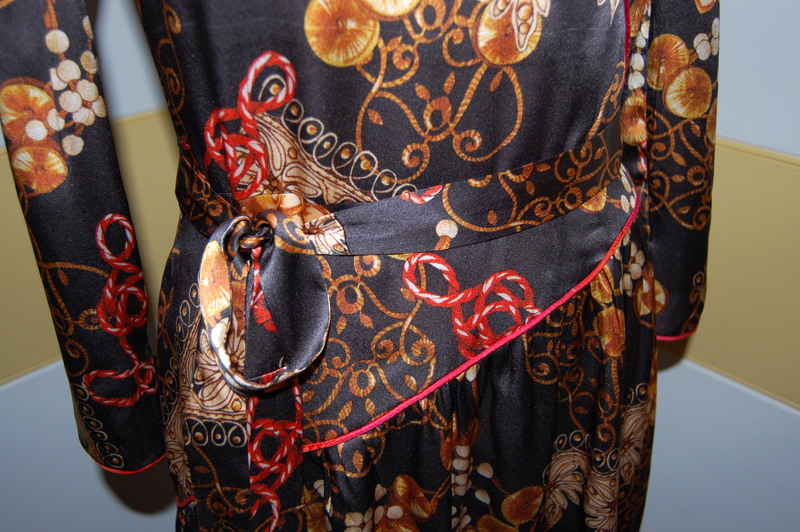 The pieced sash. 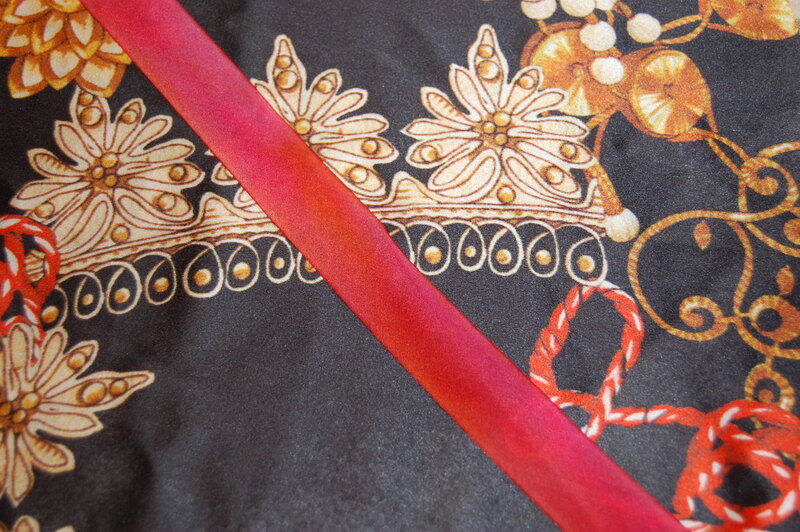 I’m glad the fabric design is so busy, otherwise the multiple seams in this sash would definitely show. 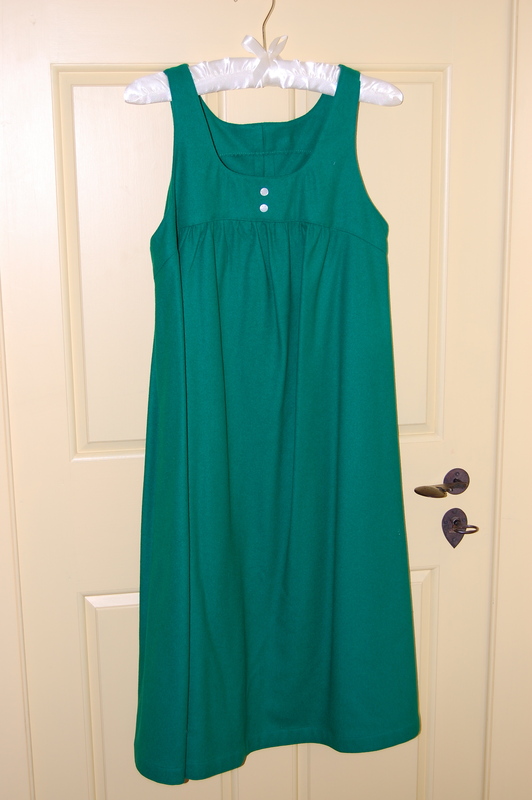 The finale details of this dress (snaps at the sleeve vents and a good press, for starters) are finally complete. I think I can finally say that I have saved this dress from a ghostly demise. The dress on the form does not show the slight tightness across the bust. A back view. 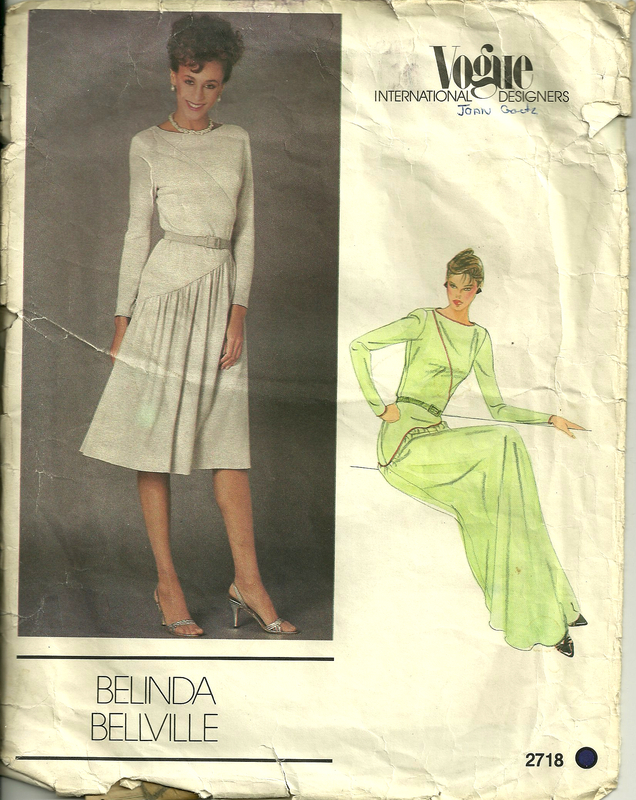 Notice the asymmetrical skirt yoke, which I think is a nice detail. 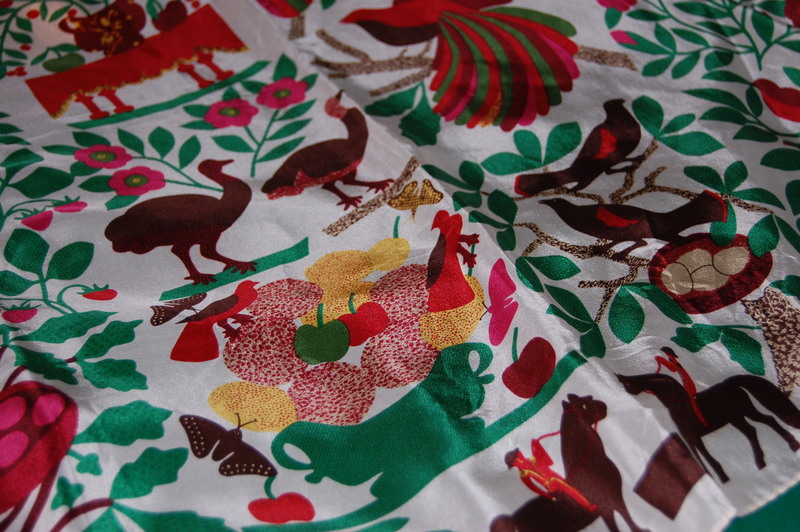 I do love this fabric! 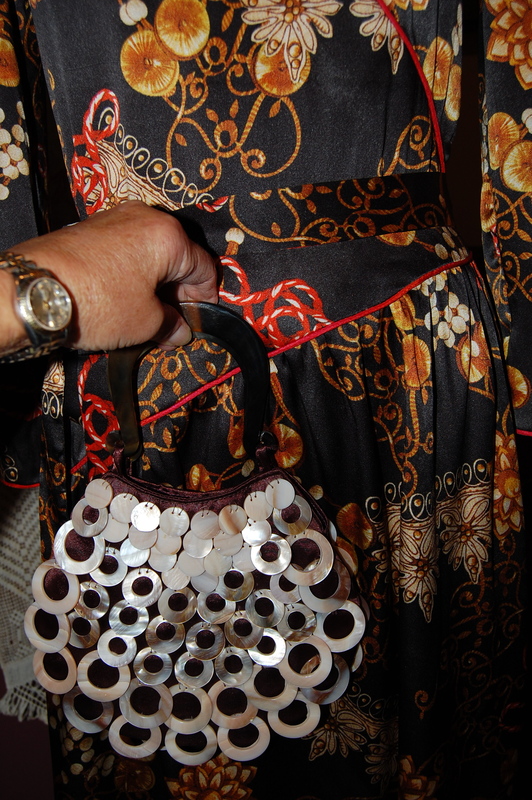 And here is something fun – a dressy handbag to wear with this dress ( a recent find from one of my travels). Finally, some photos of me wearing the “ghost” dress! 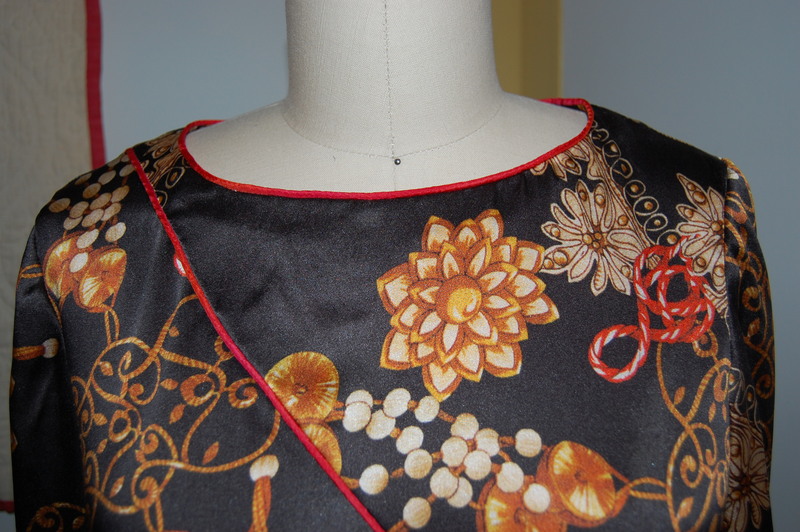 Finishing this dress successfully definitely warrants a smile! Will I ever make this pattern again? No. Have I learned from this project? Yes. Will I enjoy wearing this dress? I think so. And right now, that’s good enough. 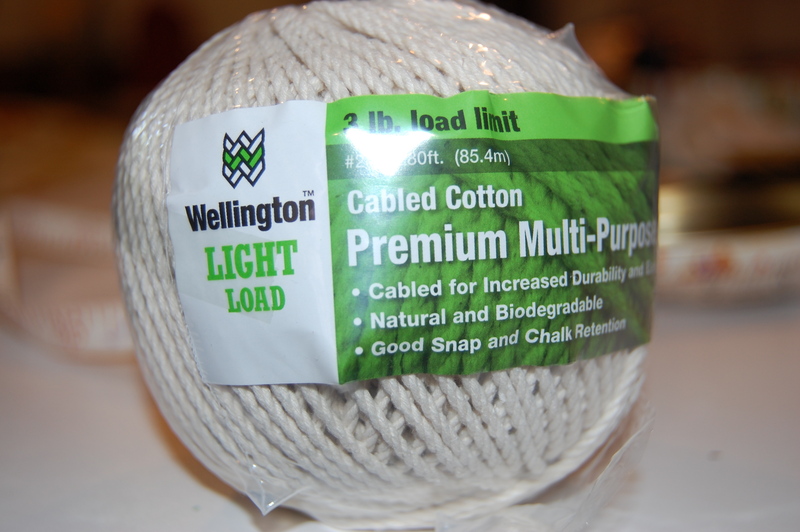 Being away, as “on vacation” (or “on holiday” as many express it), can take its toll on sewing projects. If I have to leave a project in mid-stream, it seems to take even longer to get back to it and pick up where I left off. A recent trip to the western state of Wyoming necessitated that I abandon my current “Fall” dress at precisely the time of year when I need to complete it! And now I’ve run into some complications with it. 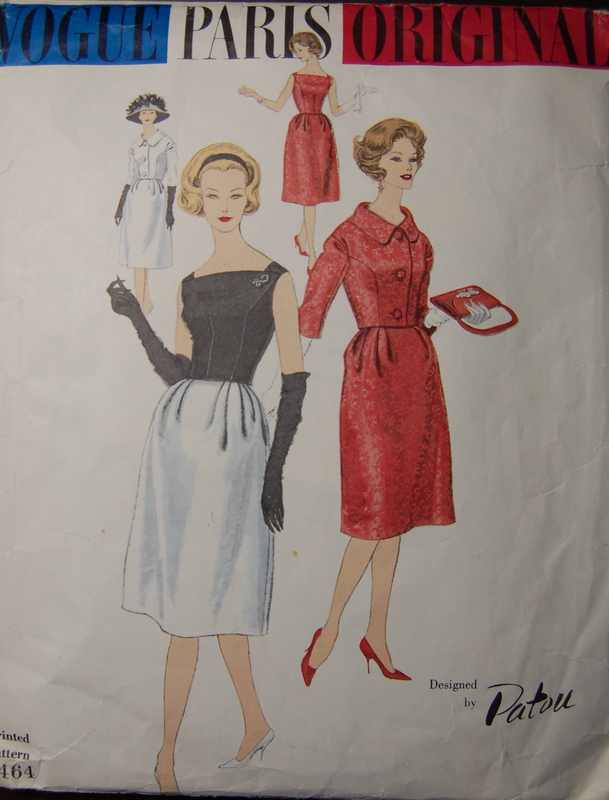 I am using vintage Vogue pattern 2718 for this dress. The fit seems okay. The neckline will need a little adjustment, but nothing out of the ordinary. 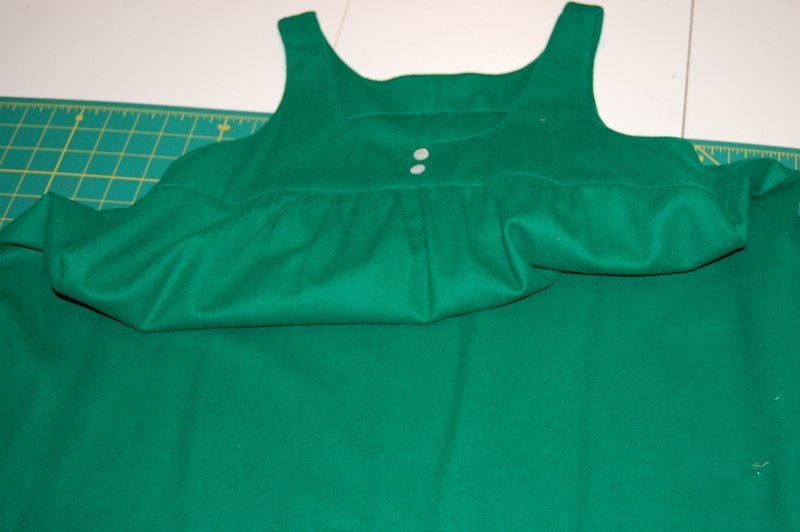 The sleeves look good, and I am pleased with the piping so far. So what is the problem? When I try the bodice on, it looks awful. It pulls across the bust, it doesn’t want to move with me at all, and the front seems too short-waisted even though it measures perfectly for me when on the form. 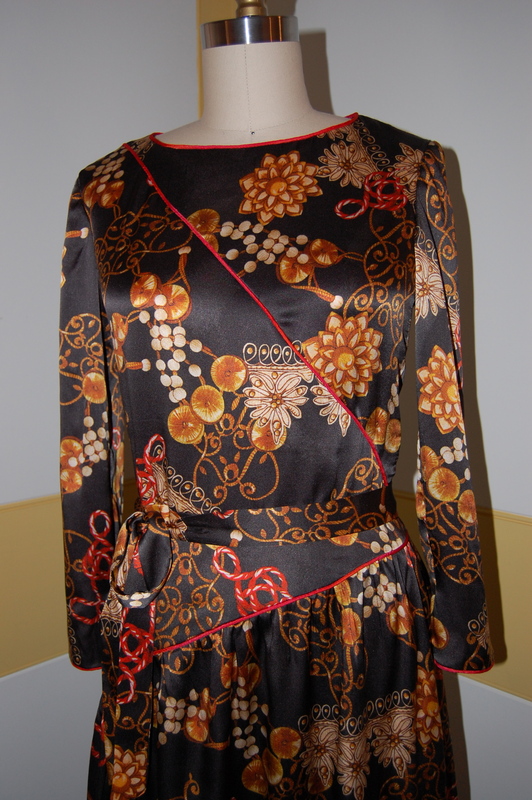 Worse still, this fabric is too dear (as in expensive) to put it aside or to think about abandoning this dress. I think I know what is wrong, and it will take a great deal of effort to try to correct it – and hopefully it will be correctable! 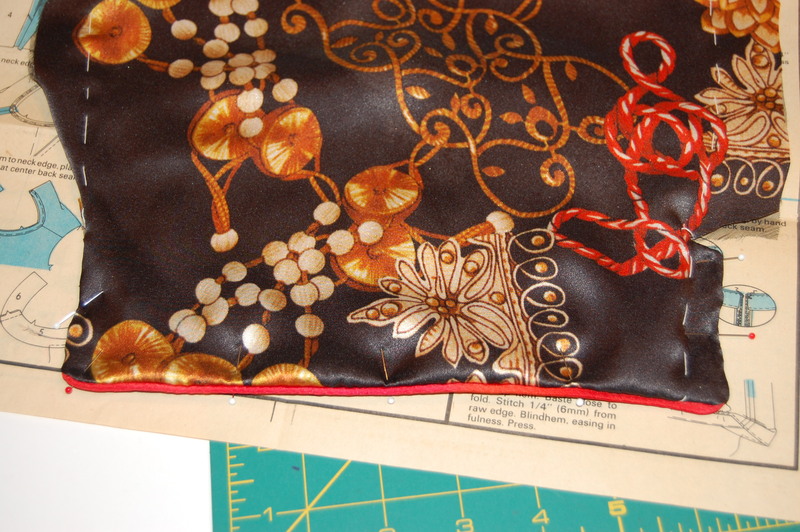 I insisted on using an underlining on this stretch silk fabric. 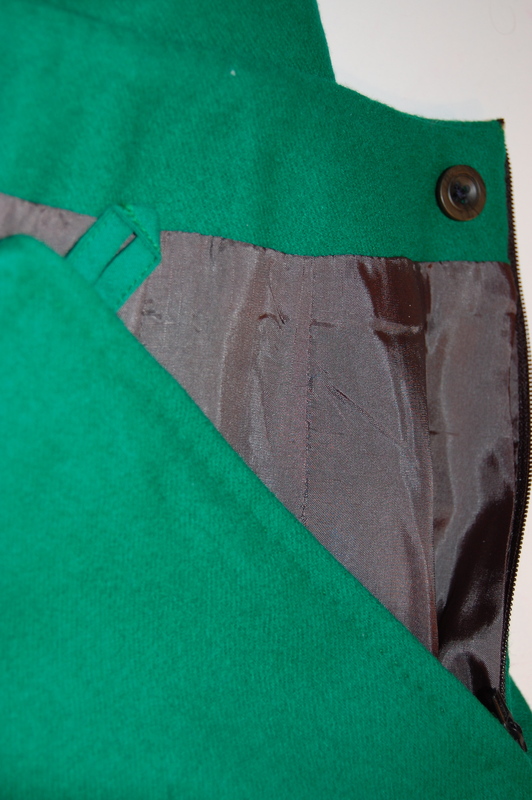 I thought I could accommodate the stretch by cutting the underlining on the bias. Guess what? It doesn’t work. 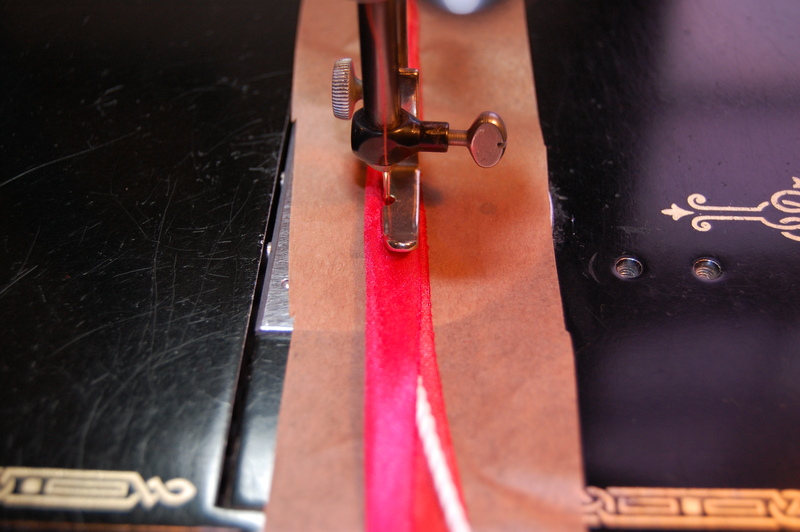 The bias pulls from underneath, restricting the stretch of the silk. What this means is that I am going to have to remove the underlining. 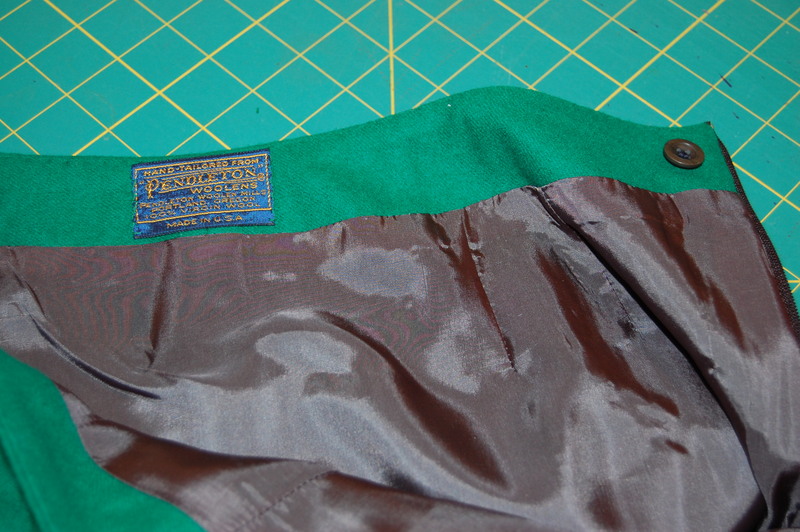 It is not going to be fun to remove black underlining from black fabric, sewn together with black thread, is it? I have consoled myself with the thought that I can salvage this project by making a skirt instead of a dress, which may be what I end up doing. Needless to say, I am fighting my discouragement, and trying to stay focused so I can finish this and move on to something more fun. 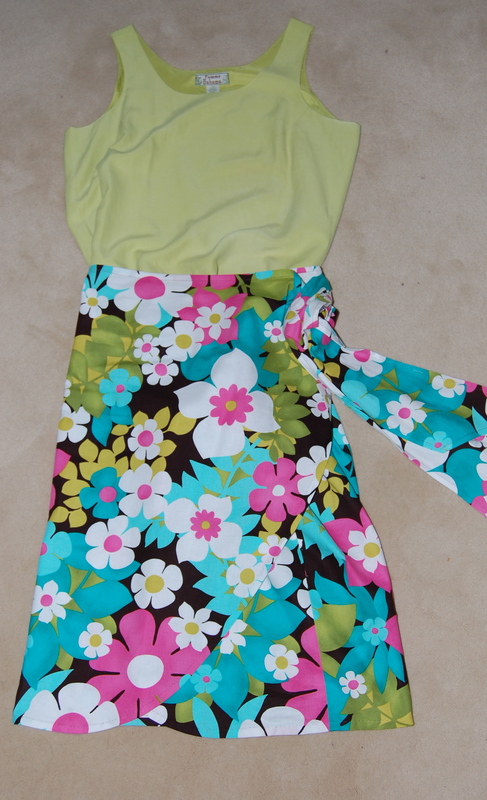 I was delighted to find this DvF pattern in my size, at a reasonable cost! 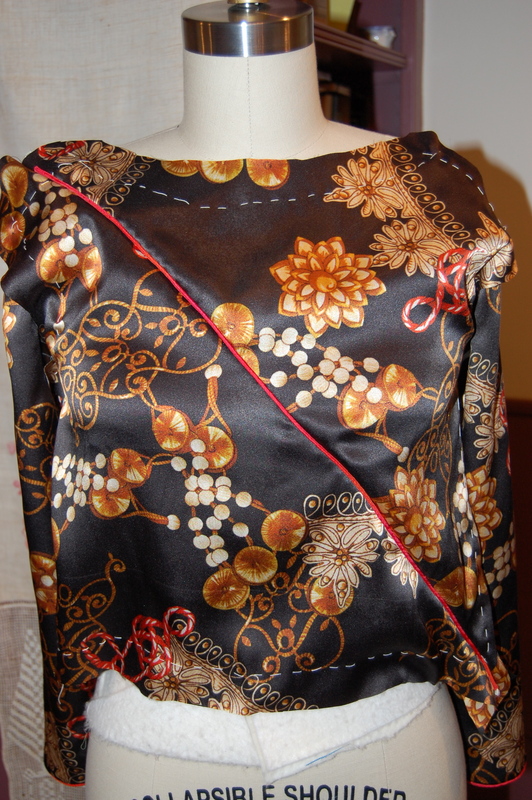 This one should see some fabric next Spring or Summer. This one was too good to pass up, although I don’t have any plans for it right now. 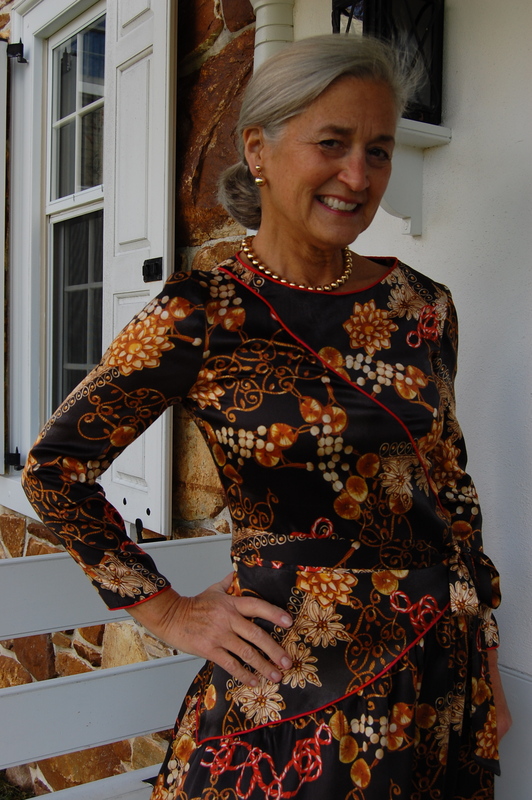 This looks like a dress, but it is really a skirt and top, paired with the jacket. The sleeves on the blue version of this blouse are so pretty! 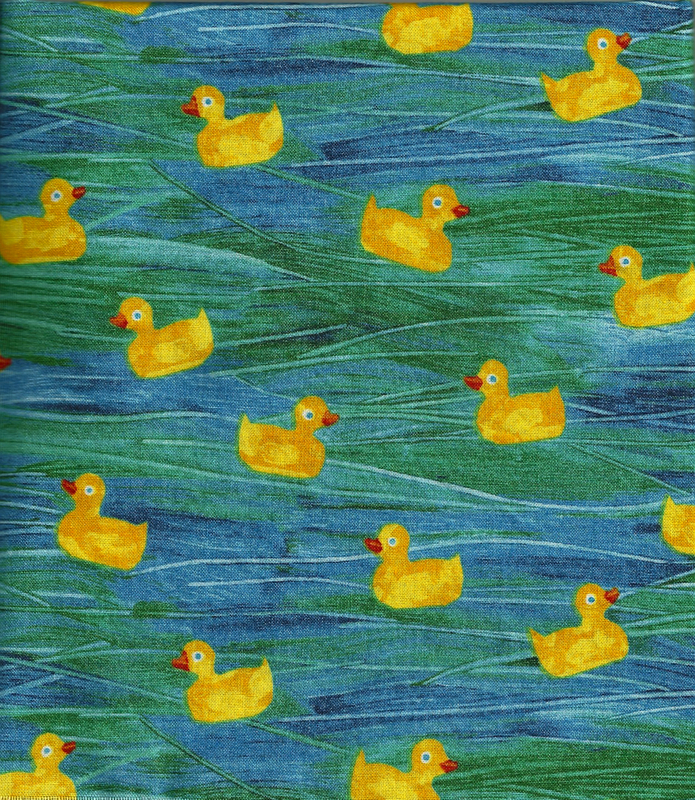 In addition to these new patterns, I just ordered two Marfy patterns, which should either add to my current sewing anxiety or help alleviate it. I hope it is the latter! 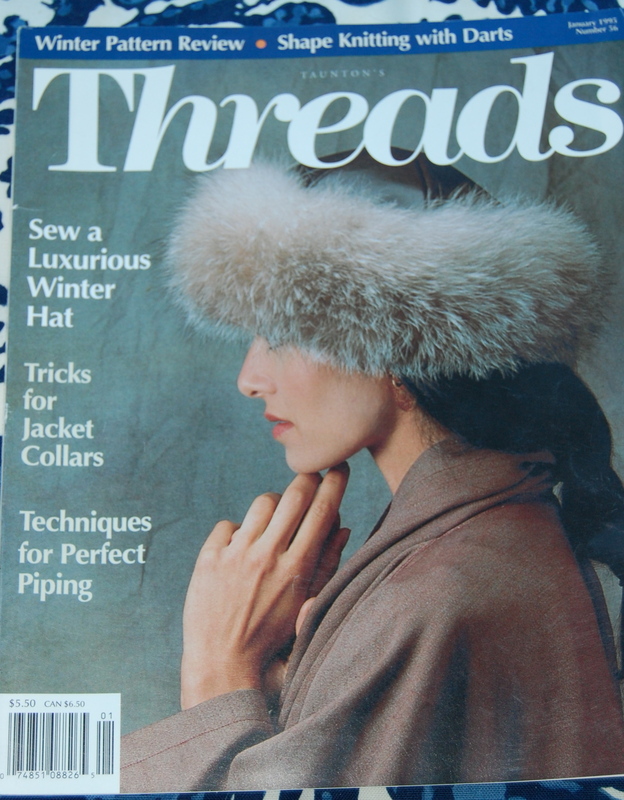 I never expected to find a pattern from the decade of the ‘80s that I liked, as my refrain about fashions from that span of time has always been: “Those ’80s’ styles were just too awful”. 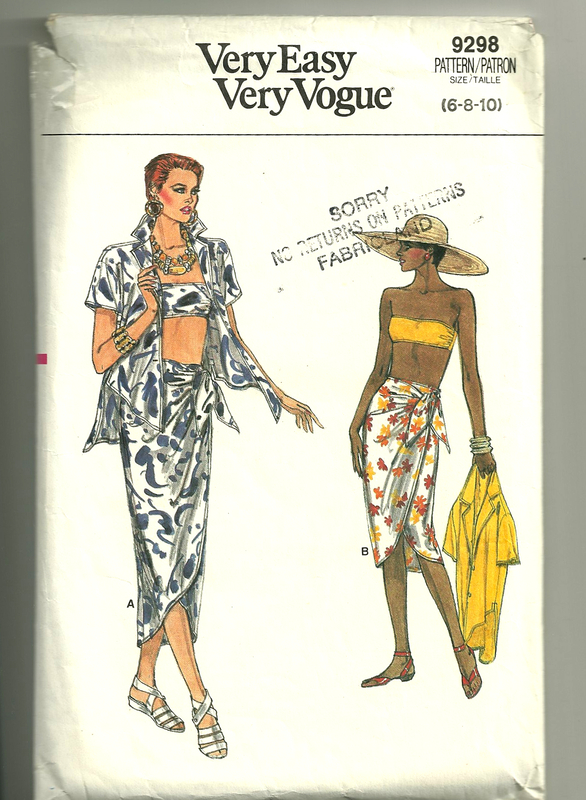 But I humbly ate my words when I finally found a pattern (from an Etsy shop) for a sarong skirt, which just happens to be from 1985. 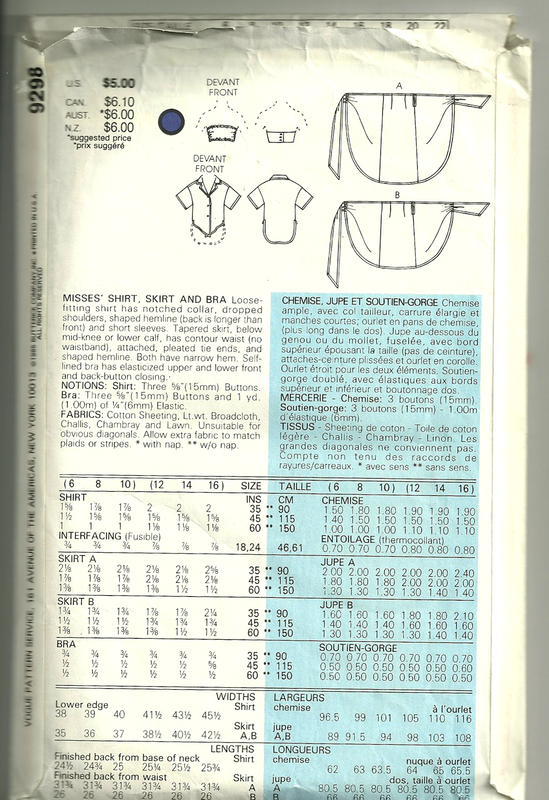 I won’t be making the bra top… And notice the “big” shoulders on the blouse, which otherwise would be kind of cute, I think! This sketch accompanies the entry for sarong skirt/dress in Fairchild’s Dictionary. 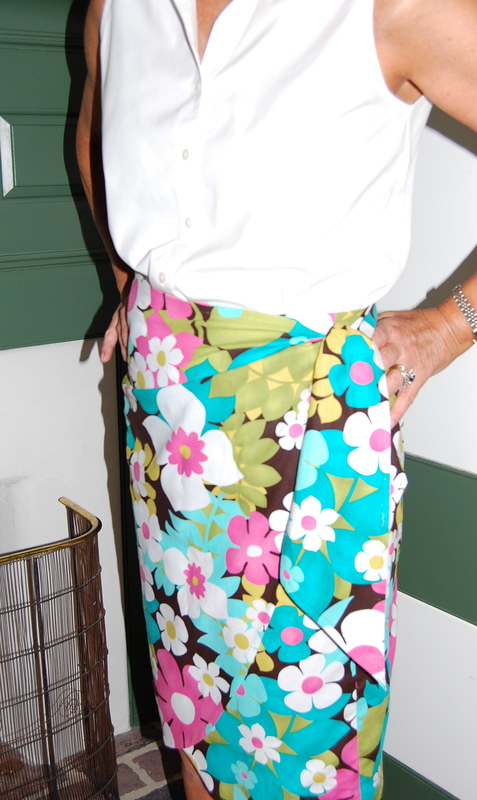 The original owner of the pattern made the long version skirt while I decided to make the shorter version. She left cryptic notes throughout the instruction sheet. 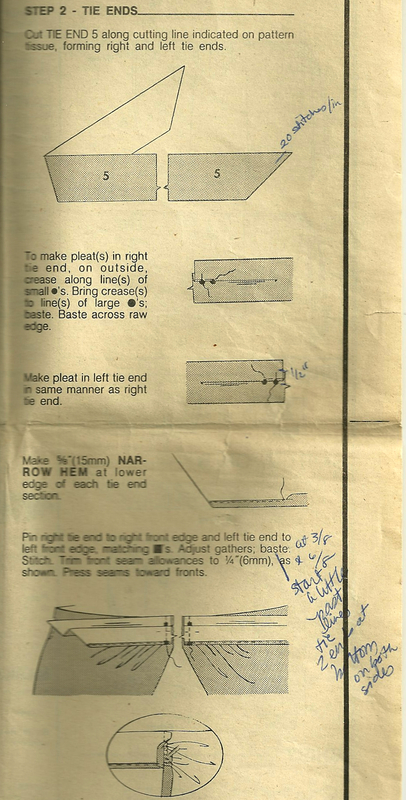 Here is an example of some of the notes which the original owner made on the instruction sheets. I made some of my own notes, but I wrote them on the muslin which I made to test the pattern before cutting into my fashion fabric. 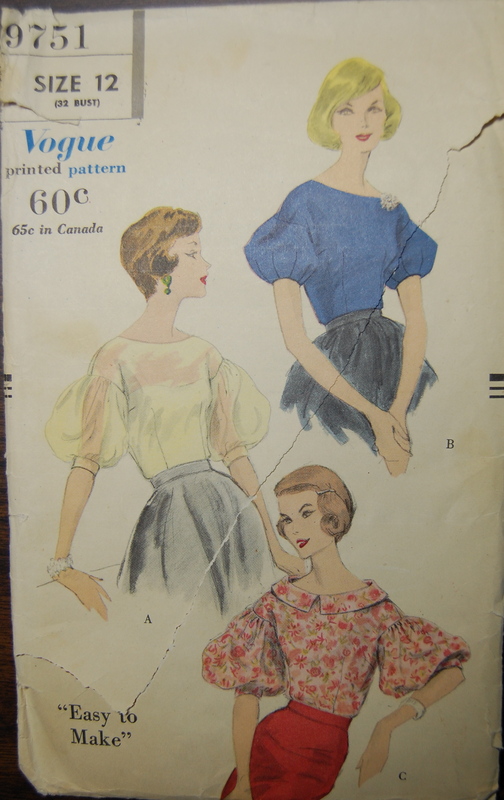 I am glad I did, too, as I discovered that the overlap for the skirt was not quite enough for a “street” skirt (as opposed to the beachy/resort intent of the pattern). So – I made the side panels each about 2” wider. 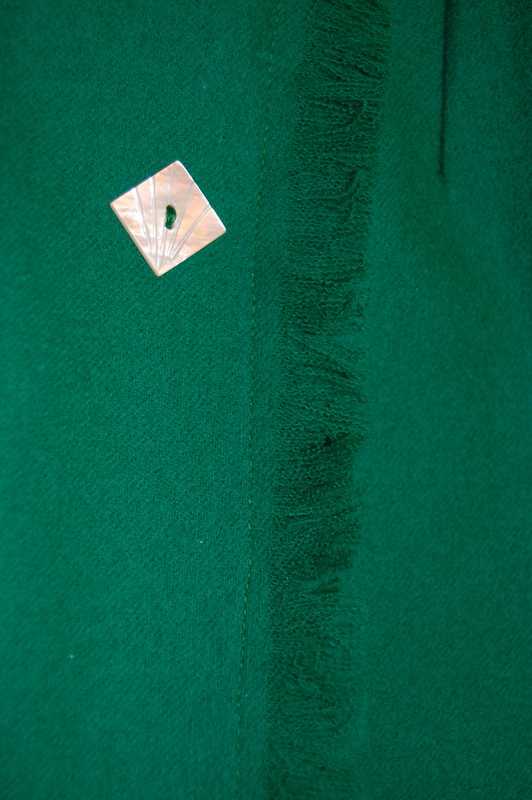 Then to make the waist still work, I added a dart in the left side front (which is the hidden side of the wrap). I made the ties each about 2 inches longer, as I thought they would be more becoming and lay flatter if they had a little more length to them. Here is the diagram from the envelope which shows the thumbnail details of the two skirts. 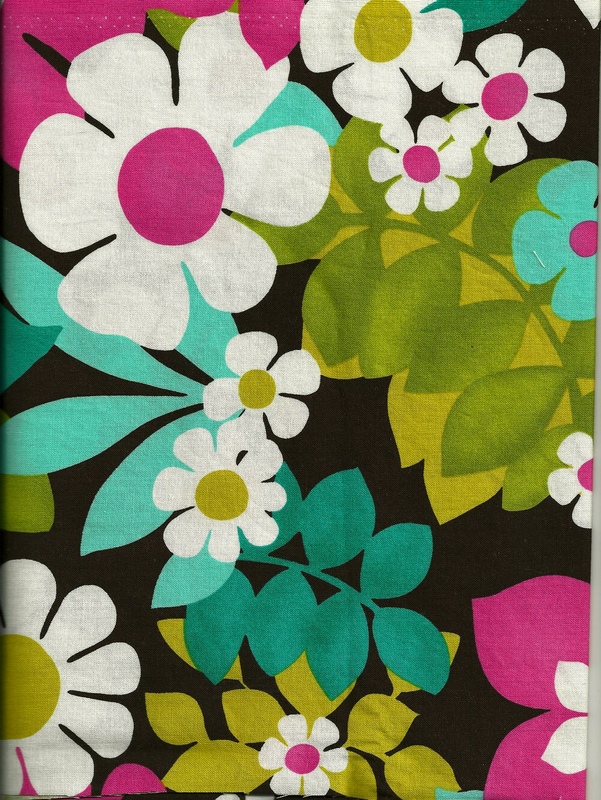 I had picked out this tropical-look fabric, ordered a swatch, then the yardage from B & J Fabrics in New York. 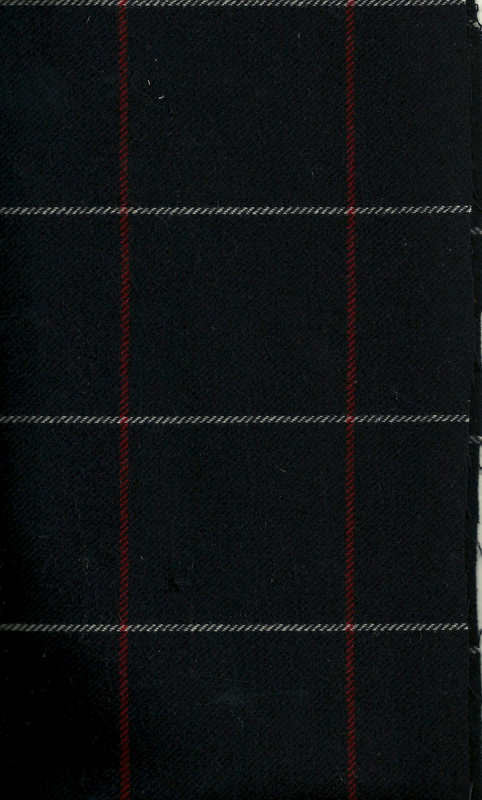 A close-up view, showing the ties. 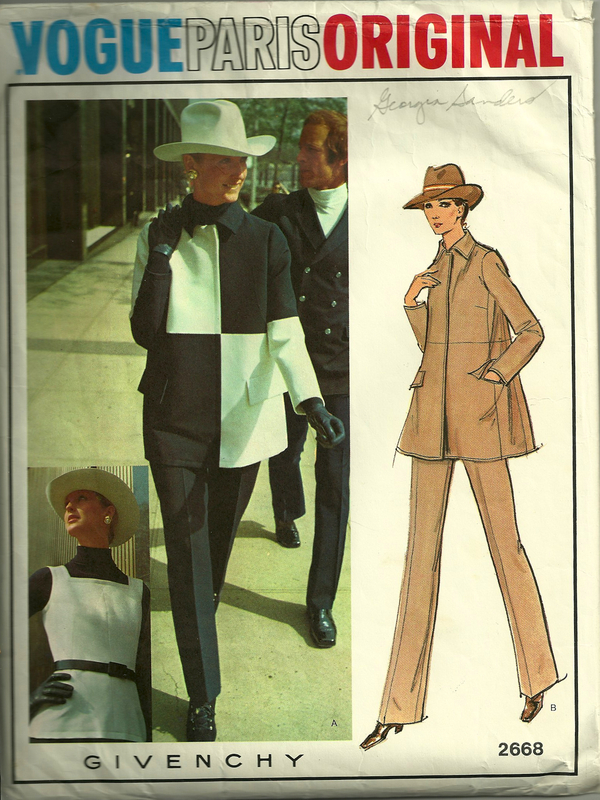 From 1937 – to 1985 – to 2012, I suspect this is one style which will never go out of style.